Population Serviced: The population serviced by the respondents were primarily school aged students (78%) with adults serviced by 13%, early intervention serviced by 7% and geriatric serviced by 2%. 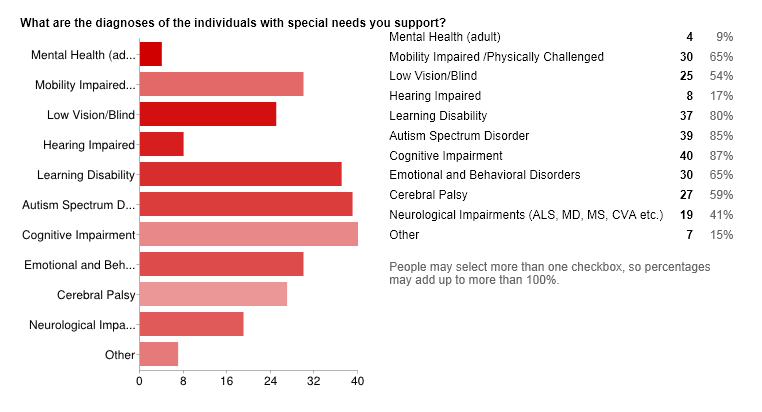 Diagnoses Serviced: Diagnoses most frequently supported by the respondents were individuals with cognitive and learning impairments, Autism Spectrum Disorder, Emotional and Behavioral Disorders, Mobility Impaired/Cerebral Palsy and Neurological Disorders. A small percentage of respondents supported Mental Health and Hearing Impaired. Other diagnoses shared by respondents were SDD (presumed to be sensory defensive disorder), Down syndrome, traumatic brain injury (TBI), dementia, dyspraxia and complex communication needs. Type of Devices: Respondents most frequently use iPads, iPhones and iPod Touches. Laptop or Chromebooks were also used by 46% of the respondents. Android devices, Kindle tablets were infrequently used by respondents. One respondent reported using other speech generating devices (SGD). Primary Purposes: The top ten primary purposes of mobile devices by respondents were for intervention, productivity, sensory activities, behavior management and rewards, visual communication, self-regulation, documentation, recreation/leisure, accessibility, organization and memory tasks. Other purposes shared by respondents included apps for demonstration to parents, fine motor and vision. The question and response choices allowed some redundancy in purposes and did not separate professional or client purposes limiting interpretation of the primary use being for professional or client use. Device Management: Device management use indicated the majority of respondents managed 2-3 devices. Mobile Device Use: Lack of clarity of this question unfortunately makes interpretation of the results difficult. If interpretation includes use of mobile devices for intervention purposes the majority of respondents use their device more than 50% of the time for other purposes. Mobile Device Use Required: Respondents indicated 22% were required by their employer to use a mobile device for work related tasks. 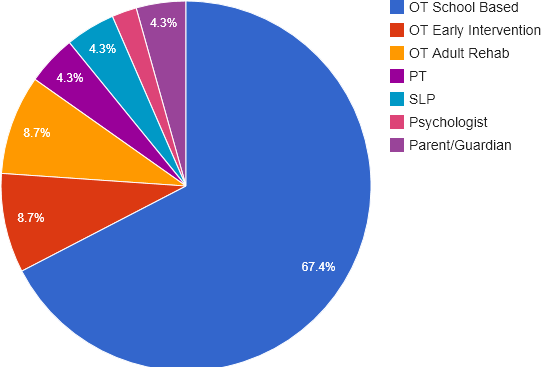 Of those respondents required to use their mobile device for work related tasks, the majority were school based OT’s with one OT working in rehab and one OT working in early intervention. Summary: The survey was completed by 46 respondents with the high majority being school based, 0-3 intervention or adult rehab Occupational Therapists. Majority of respondents supported children or students ages 0-3 or 4K to 12th grade with diagnoses of cognitive or learning impairments, Autism, emotional or behavior disorders, mobility impairment or CP, low vision or other neurological impairments. Results appeared to indicate mobile device use is applied to similar diagnoses whether used with children or adults with exception of neurological impairment diagnoses reflected with adult usage primarily (driven by item description on the survey). Uses of mobile devices were primarily for intervention or remediation with sensory, behavior management, visual communication, self-regulation, leisure, organization/memory, accessibility and communication intervention being the highest percentage of purposes identified by respondents. Devices use was also most frequently used for productivity, documentation, data collection by respondents along with lesser responses indicating professional use for Internet research and modification of inclusive curriculum for students. iDevices were the most frequently used devices by respondents with the majority of respondents managing 2-3 devices with some managing more than 15 devices. However results also showed many individuals also use laptop, netbooks or Chromebooks along with tablet or personal digital/smartphones which mirrors usage of the general public. Unfortunately, lack of clarity of the question of percentage of time the device was used makes interpretation difficult. Responses regarding if device use is required by employers indicated the majority of respondents are not required to use mobile devices. Almost a quarter of school based and one rehab OT indicated mobile device use was required by their employer. Results of the survey indicated mobile devices are being embedded in a wide variety of uses with adults and students by a variety of stakeholders that support children, students and adults in their occupation. Parent responses indicated targeted uses as a dedicated device that supports individual needs. Some questions lacked clarity or possible responses that might reflect more accurately mobile device use. The survey also indicated device use show frequent use by professionals for productivity purposes. Having performed a similar survey my school, it is interesting to find that the interventions of both surveys were similar reflecting the nature of the tools available and use of mobile devices. Thank you again for your time spent in responding to the survey! This entry was posted in Early Childhood, Occupational Therapy, Rehabilitation, School Based Interventions and tagged occupational therapy. Bookmark the permalink. This is very interesting and came just at the right time for me! I will be starting a new 6 hour continuing education course in December and will be talking about technology in the afternoon. I truly am unsure how many people use IOS vs Android devices. I don’t want to bore anyone if they have one or the other. Thank you Kim, I still am not sure how representative this is as the respondents were primarily school based but I am glad you found it interesting. I also certainly made some mistakes with the survey questions I wish I could go back in time and fix!! I am assuming you are teaching the course? Although the poll appears to not address Android vs. iPad use of mobile devices – I did find a survey in OT Connection that provided some information on device use specifically with OT’s. Here is the link : http://otconnections.aota.org/blogs/pulsecheck/archive/2012/02/27/aota-apps-list.aspx . You might find more buzz out there on mobile device use is available however you need to be an AOTA member which I am not at the current time. Thank you for your time taken to comment Kim, I appreciate and value the feedback! Your app list is definitely more comprehensive and longer but there are some on there that I haven’t seen. I am somewhat surprised that they did not create listing under the Framework Domains of the current Domain and Process, although I have to admit I find them a challenge to relate to with my old learned models of OT. The Sensory Apps come from Beth Lloyds OT website – quite interesting but not updated. Are there many under the rehab, disability, work and industry? There seem to be less of those apps, although there are some ergo and testing apps out there for adults. I have some reorganization and updating to do with my list but time is really limited these days!